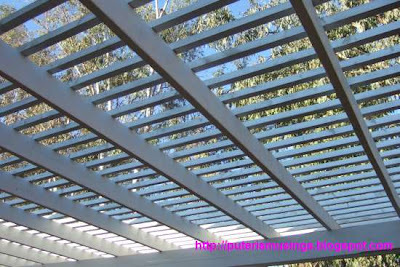 A pergola is a garden structure with an open wooden-framed roof, often latticed, supported by regularly spaced posts or columns. The structure, often covered by climbing plants such as vines or roses, shades a walk or passageway. This is the pergola that we built on the west side of our house. 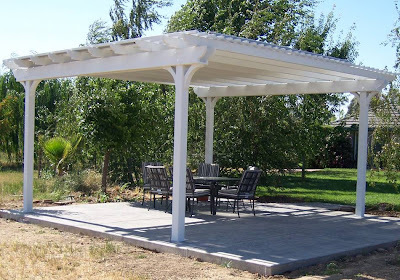 It is a shade structure but not to give shade to a walk or passageway. It is a stand alone structure. Doug needs to order the clear roofing that he wants to put over the top. We've been to Home Depot, Lowe's, and Meeks, and none of them carries the kind of roofing that Doug wants. That is why the pergola is what it is now. Near completion, and not ready for what we want to do with it. We are planning to build another pergola in the center of our backyard. I hope to be able to plant some creeping plants on that one. Wisteria would be nice but it takes a long time to grow. I thought about morning glory or grape vines. We'll decide once that structure is built. This is Noel. He is a professional in the construction business. He built the pergola for us. 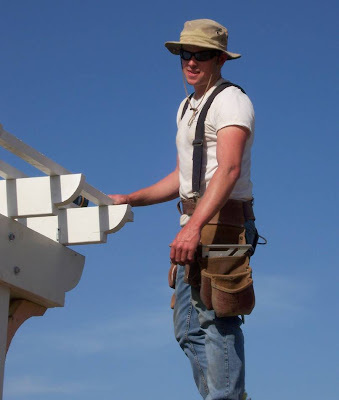 This picture is of him building the pergola at Kathy's house. I did not take any pictures of him building our pergola. Richard (Kathy's husband) is a lot better at documenting the pergola that he had built in his back yard. This is Kathy and Richard's pergola that Noel built. Our pergola was the guinea pig because it was the first that Noel ever built. 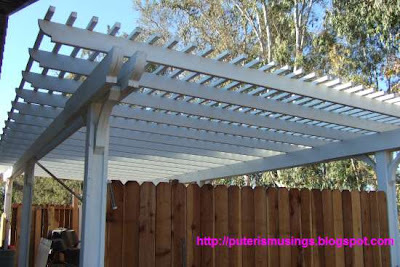 This pergola is similar to the one we have. Right now we have someone do some tractor work around the house. Once the grass is planted and established then we can think about building the next pergola. This is nice. So u plant flowers and trees thingy around it? Heheh, I have to today because I wrote three paid posts! Good thing can still find some topics to write about! The one we have built, we won't have any climbing plants on it. The next one we built we will plant a climbing plant on it .. more beautiful that way. just checked out your pergola. We have built two and are in the process of building a third. We are going to put plexiglass over ours also and have found a site where you can buy it by the roll. It is thin but since the 2 x 2's are close together that should not be a problem. So if you are still looking for plexiglass check this out. http://brands.hardwarestore.com/428-3300-warp-brothers.aspx Also I have found from the last two homes we have landscaped that Wisteria does grow very quickly to cover a pergola.